For example, much as it’s great that Nero finally decides to just take the blame, it’s also great that Patterson decides to let Nero off the hook. After Toric died, she started to embody some of his character traits, becoming overwhelmed by a desire for justice rather than using her brains. Now, she’s both using her smarts and listening to her conscience, and the mourning parent committing suicide is a cathartic moment for her. On the other hand, I wish the guy didn’t commit suicide. It essentially absolves the Sons of their sins. Sure, Patterson’s now really bent on taking them down and they feel some guilt at the scene, but come on, these guys deserved worse than this a long time ago. They’re just as much at fault for the shooting, and there should be consequences…you know, not just the “obligatory season finale event that makes all these biker dudes sad for a bit”. As for the rest of the episode, it’s mainly taken up by the Tara-Gemma storyline. I’m glad Unser acts as a medium here, calling both women out on their actions, as well as their subsequent weak family justifications (shades of Walter White there). For Tara, while it’s understandable she feels guilty about leaving her life behind, she also needs to leave; otherwise, this whole storyline would result in absolutely nothing. Still, I think she’ll leave. Her husband is her weakness, and she’s trying to escape from his influence; him finding out about the plan shouldn’t deter her one bit. -Man, Juice has got some issues. Next week, he jumps off a building, then changes his mind halfway through. -I can’t help but feel bad for Wendy. -Just break out of prison already, Clay. 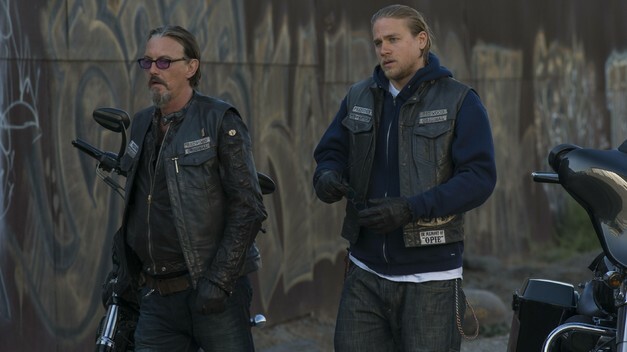 Credit to FX and Sons of Anarchy for all pictures. I own nothing.